Here we are into a New Year and, as always, the first month of any New Year sees many of us making New Year resolutions and an annual pilgrimage back to the gym. My issue is that my knees are rather weak after many years of marathon running, high impact aerobics and overuse, so I’ve decided to take it easy instead, and my realistic fitness goal is to power-walk for 20-30 minutes every morning instead. So far so good and no injuries! I’ve found that resolutions tend to fall by the wayside quite quickly so, for career success, I like to focus on INTENTIONS instead. Have you thought about your career intentions for 2019? As a Career Coach I work one-on-one with career transition clients and deliver empowering Career Confidence group workshops in a corporate environment. That’s why I’m happy to say that setting career goals is a firm trend when the new year arrives and research has found that 45% of us will be investing in up-skilling this year, 37% plan to be more outspoken and take control of their ambitions at work, and 16% are committed to expanding upon our professional network. So, I’d like to suggest 3 intentions to help you progress in your career this year. 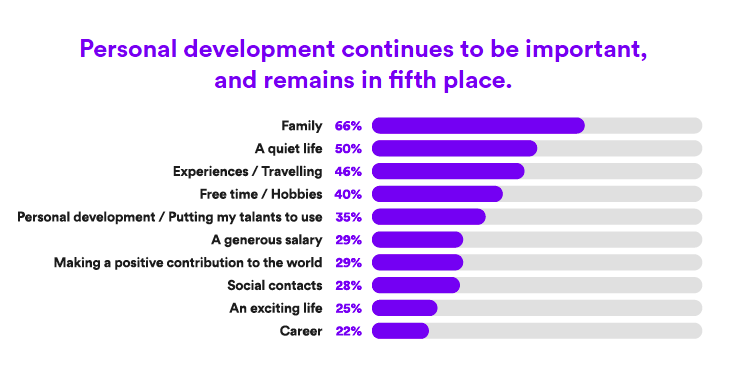 According to research by GoodHabitz, the biggest career trend tipped for 2019 is personal development. After Family (66%), A Quiet Life (50%), Experiences/Travelling (46%) and Free time/Hobbies (40%), (which are personal values) the top priority for respondents professionally is:/Putting my talents to usePersonal Development/Putting my talents to use (35%) above Salary, Contribution to the world, Social contacts, an Exciting life and Career. However, only 10% of organisations globally are taking on full-scale projects to up-skill their workers. It means that, if your organisation isn’t able to provide you with the training you desire, you have to take matters into your own hands. Take control of your own education. Do you want support to take control of your career? The Careers Academy Online is a free membership site where you will gain access to career resources and training for your professional and personal development. In the Academy you will find a free ‘How to Get a Job’ online course, numerous free guides and also special offers on ‘How to Write a Resume’, ‘Personal Branding for Career Success’ online programs and much, much more. Is your intention to develop personally and professionally this year? Then take action and make Your Learning Potential Your Earning Potential. High self-esteem and confidence is a key component of success. Whether you are a man or a woman, a dip in your confidence level can have dramatic effects on how you are perceived, and what you achieve at work. I am on a mission to help you to grow your self-belief, develop your ability to handle life’s little (and big) challenges by assisting you to become resilient. Yes, we all experience setbacks (and I have had many in my life) however it’s how we deal with those setbacks that form our character. Every setback is an opportunity to develop resilience. To help you bounce back, in The Careers Academy Online you have the opportunity to explore ‘How to Build Confidence’ – an online program I created to help you through those challenging times and ensure your intention: Banish Self-Limiting Beliefs and Trust Yourself is fulfilled. I know … the word ‘networking’ causes many of my clients to cringe … initially! They think that networking is ‘schmoozing’ or behaving like a sycophant for personal gain. But, believe me, networking is neither of those! If you develop mutual trust and respect with each other then, and only then, may career or business opportunities arise out of the relationship. We are all genuine human beings. Let’s get to know each other, human to human! This is why #linkedinlocalsydney events are so popular. I co-host these events with Jillian Bullock, and at our events you can be the star of the show (if you wish) however, the focus is on making authentic connections in a warm and friendly environment. Follow me LinkedIn for the links to book our next events (scheduled for 30 Jan, 26 Feb, 15 May, 14 Aug and 27 Nov 2019). Expanding your network online is a wonderful thing and then taking those online connections ‘offline’ solidifies the relationship. Combining both is the perfect way to fulfil your intention: Your Network is Your Net Worth. In The Careers Academy Online you also get the opportunity to network no matter where you are in the world through my monthly Group Mastermind Sessions. I personally host these career-coaching sessions, and provide coaching and advice in a small group setting. I look forward to supporting your personal development intentions. Let me know of any other intentions you set for yourself this year – please pop them in the comments below. And I hope to ‘meet’ you in The Careers Academy Online too! It’s free to join and I provide a treasure trove of content and value to enhance your career. Let’s make 2019 a happy, healthy and successful year!